The Macallan has unveiled Edition No.2, a new limited edition which is available in Australia from September 2017. This latest release, the second in the Edition Series, brings together seven handpicked cask types from four different cooperages to showcase the strength of co-creation and mastery by the Roca brothers of El Celler de Can Roca (Michelin starred and twice named best restaurant in the world) along with The Macallan Master Whisky maker, Bob Dalgarno. Continuing the diverse story of The Macallan’s oak casks and their obsession with wood, the focus continues The Macallan’s commitment to unlock the workings of the intricate whisky making process and give people the chance to explore how the whisky was created. From the provenance of the oak to the expert crafting of the cask, the seasoning and the size, it is these diverse components and, in this instance, the distinct personalities of the collaborators, which have ultimately shaped Edition No.2. The masters behind this collaboration are Bob Dalgarno, The Macallan’s Master Whisky Maker and the Roca brothers, co-founders of El Celler de Can Roca. The distinctive and dynamic character of Edition No.2 has been shaped not only using seven exceptional oak cask types, which contribute up to 80% of the character of The Macallan, but by the creative spirit of each of the four collaborators. The whisky is crafted from seven different cask types handpicked by the collaborators to represent different aspects of their personality. The European oak Tevasa casks selected by Bob Dalgarno define and carry the shape of Edition No.2 with characteristic notes of rich, dried fruit. This speaks of his ever curious, patient and empathetic character. This is closely followed by notes of green wood and toffee from the Diego Martin casks selected by Joan Roca, American and European. These casks bring to life the generous, reflective and passionate nature of this co-creator. The notes of allspice and ginger come from the European oak Jose Miguel Martin casks selected by Josep Roca which denote of his complexity, warmth and maturity. Finally, notes of citrus and light vanilla combine from the American oak Vasyma butts and puncheons chosen by pastry chef Jordi Roca which reflect the lively and vivacious aspects of his larger than life personality. Spain is a key element in the story of Edition No.2. Not only is it the home of the Roca brothers, it is one of the most influential factors in the final character and profile of The Macallan, due to the extent of the cask production and seasoning that takes place across the country. The seven cask types that underpin Edition No.2 have been taken from four Spanish cooperages – Vasyma, Diego Martin, Jose Miguel Martin and Tevasa. 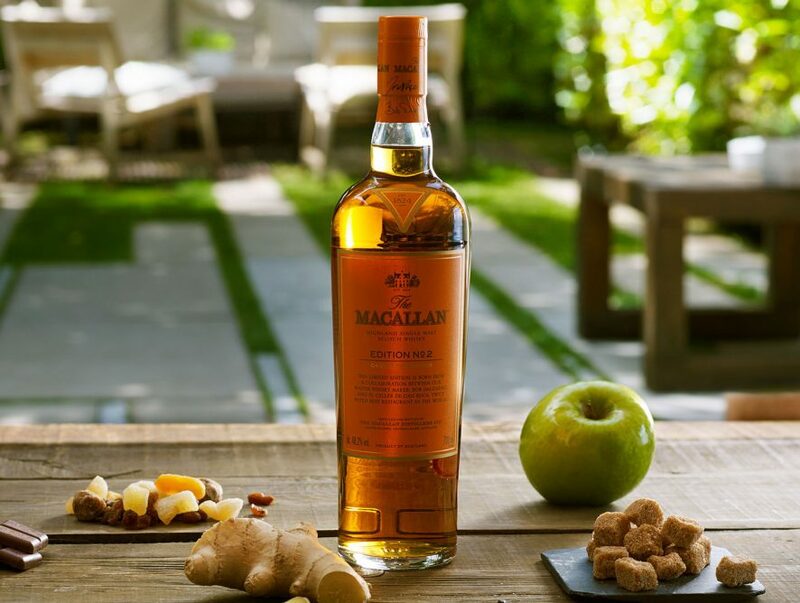 With an ABV of 48.2% for a richer and fuller flavour, The Macallan Edition No.2 presents a warm, spicy and complex character that brings to the fore notes of apple, oranges, toffee, dried fruit and vanilla. A complex, yet approachable whisky that challenges expectations and reflects the uncompromising creative spirit of the collaborators. Aroma: The nose leads with treacle, ginger, toffee apples and rich fruits. Layers of vanilla open into tropical fruits and subtle green wood. Finish: The finish is full, slow, warm and wonderfully viscous. Available from September from all good whisky retailers, The Macallan Edition No.2 limited release will never be repeated and is a collector’s item.